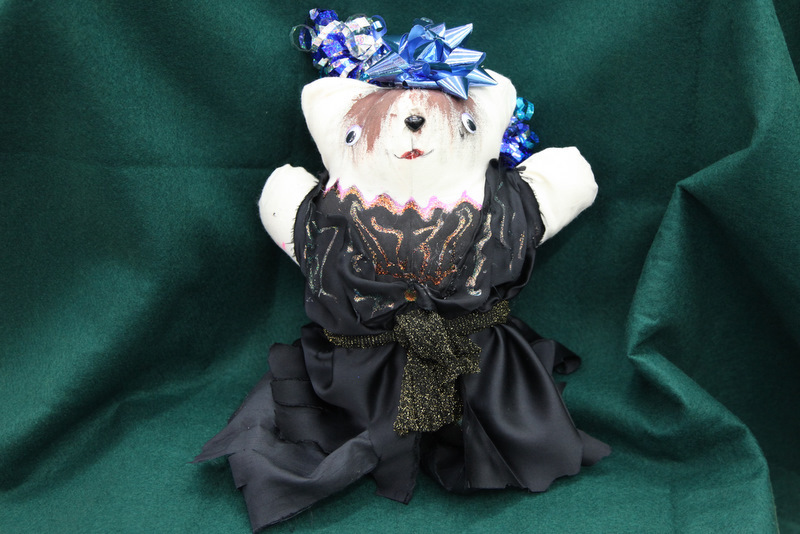 Our Grade Six students have been busy making calico teddybears using the Teddy Bear blanks available from Zart, a great Art Supplier here in Melbourne, Australia. 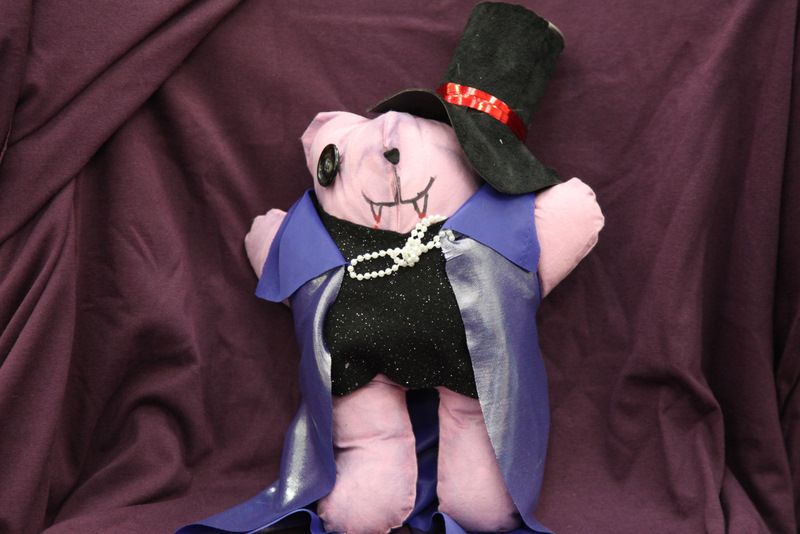 The students were given the freedom to create whichever character they wanted so there was a large variety of colours and “bear fashions” throughout the four Grade Six classes. 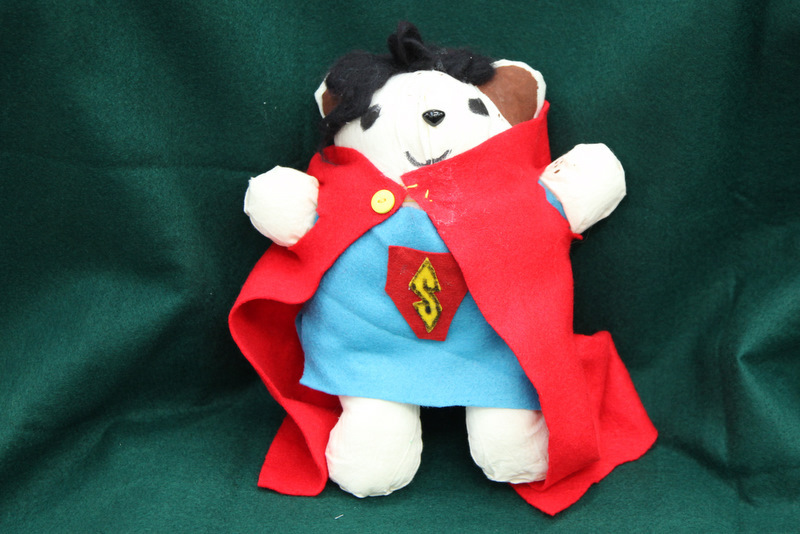 It’s hard to believe that the calico bear blanks from weeks ago have emerged with personalities to complement those of their creators. 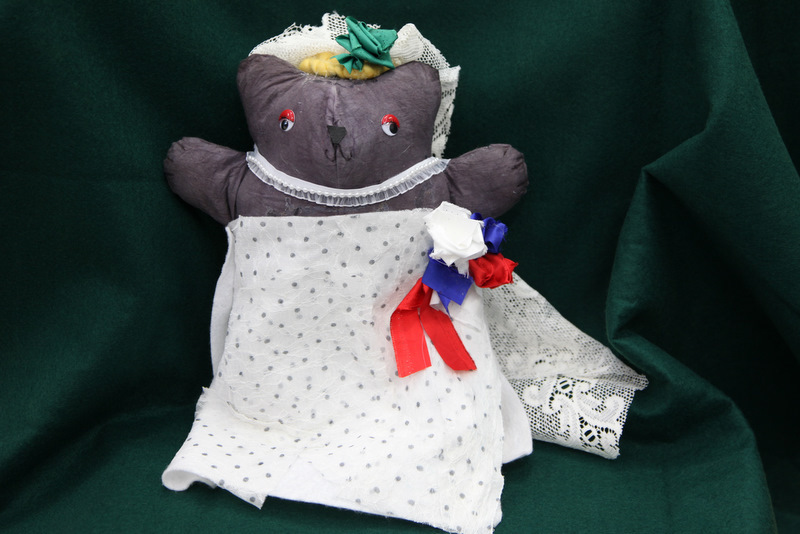 Hopefully these bears will be “keepers” and will live in the rooms of our wonderful students for many long years. 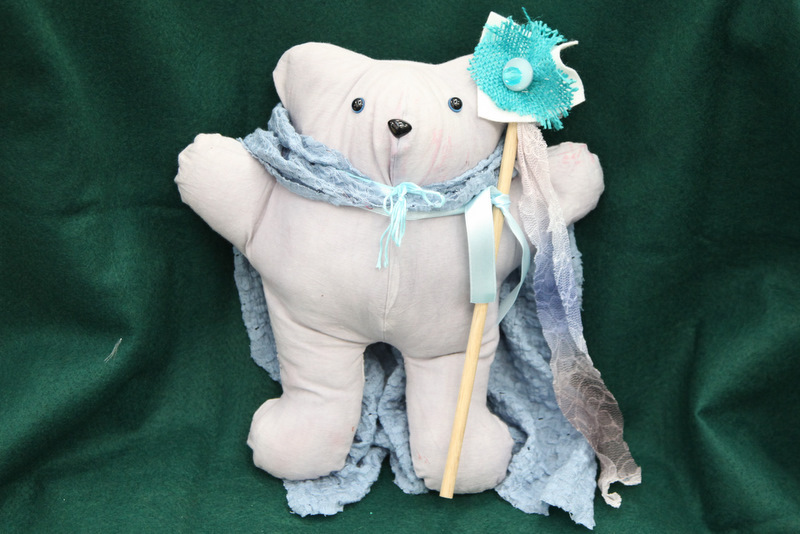 Congratulations to our bear makers and our Work Education student, Jason Heagarty who took the photographs. Well Done everyone. Yesterday was a rainy day here in Melbourne, Australia, but the rain did little to dampen the spirits of our students and teachers as we waited for our local Member of Parliament, Hon. Brendan O’Connor to officially open our new Classroom block and Library extension. After the singing of our National Anthem, Advance Australia Fair and our new School Song our Principal, Mr Chris Sevior, introduced Mr O’Connor. 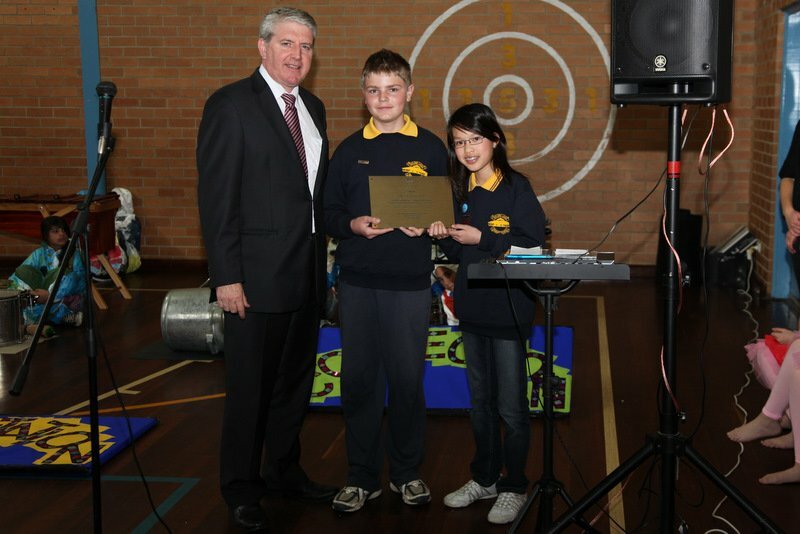 He spoke about the reasons behind the Federal Goverment’s BER allocation of up to $3,000,000 to each school in Australia in order to upgrade their existing facilities. He explained that was an investment in a better future for all our students. 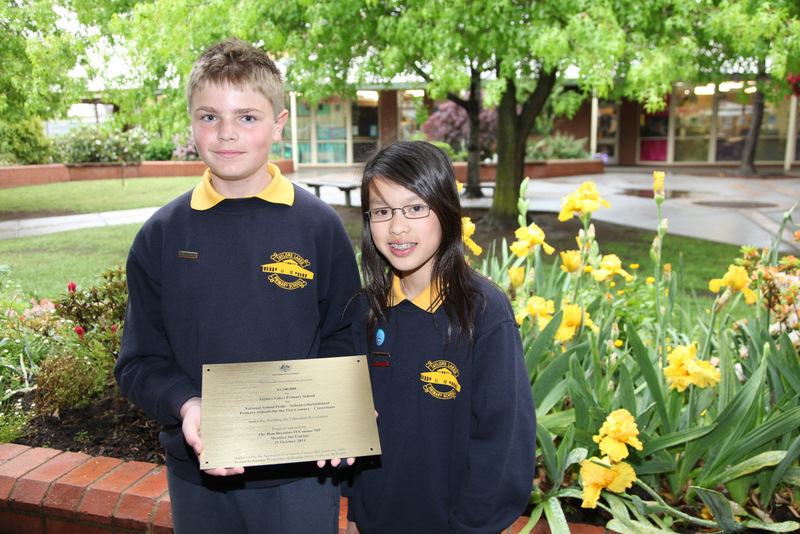 He handed over a plaque to School Captains, Daniel and Jennifer. It will be displayed prominently on the new buildings. Our six new classrooms, Computer Centre and vastly improved Library are already being put to good use to enhance our great learning environment. So, as the School Song ends, “Lakers all the way”. 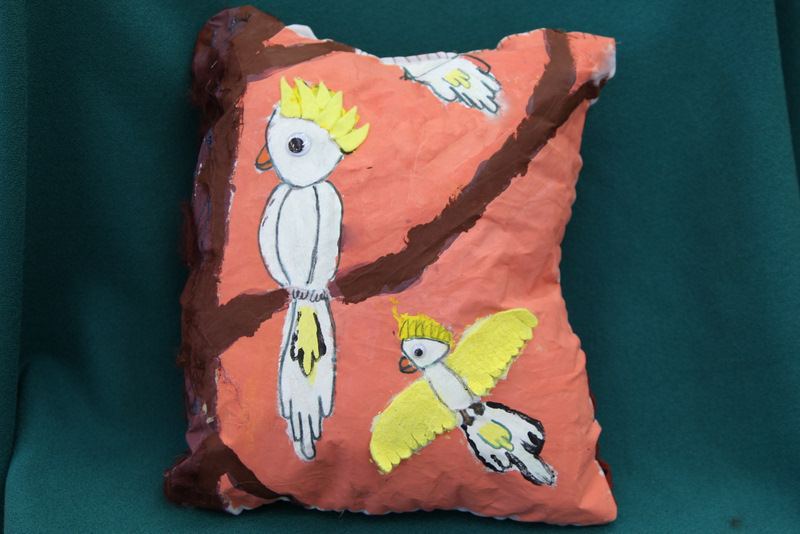 Grade 5 student Natalie, from 5 PL, drew her original cushion design based on an Australian theme. “Cockatoos at Sunset” provided a snapshot from Natalie’s experience which has been well represented in paint and mixed media. A close look at the tree trunk reveals threads which Natalie used to imitate the texture of bark. Our warmest Congratulations go to Natalie. 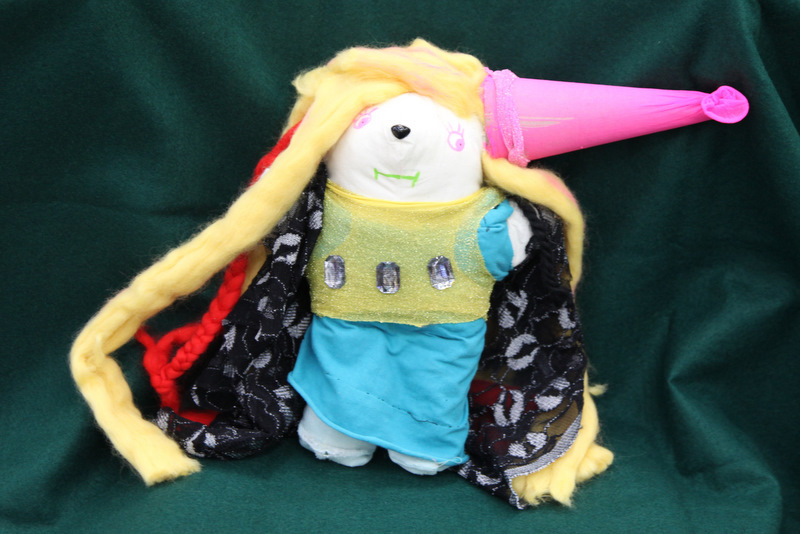 She is a great ambassador for Australian youth and their art. 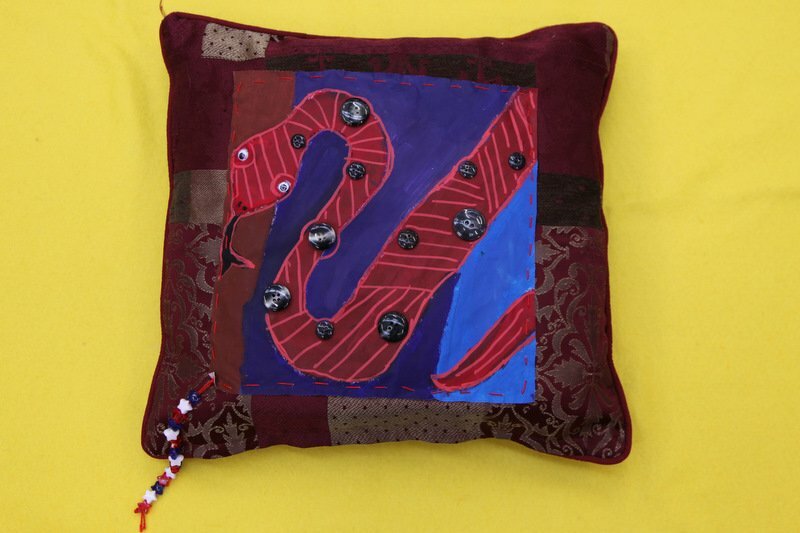 The original purpose of our Visual Arts Blog was to showcase student artworks so today I am adding a photo of one of the decorated cushions made by Grade 5 students. 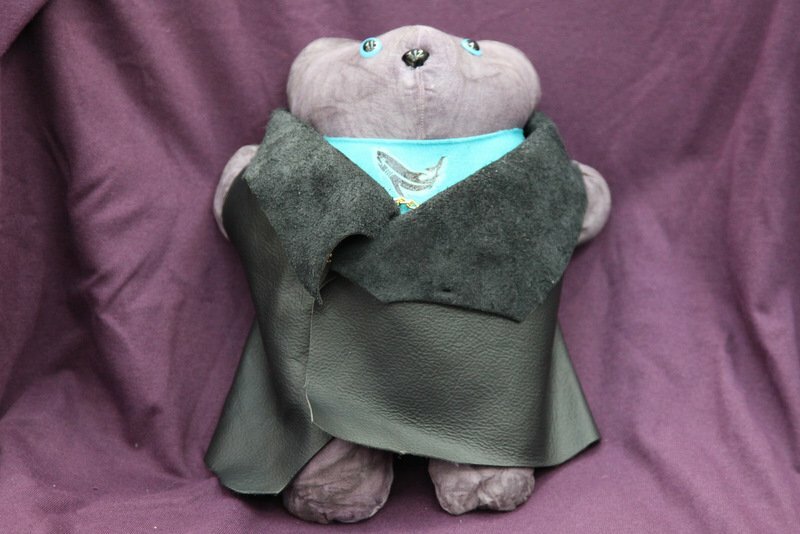 This one, by Monique B, features polycotton fabric which has had her design painted on it and then she has sewn that piece onto an existing cushion. 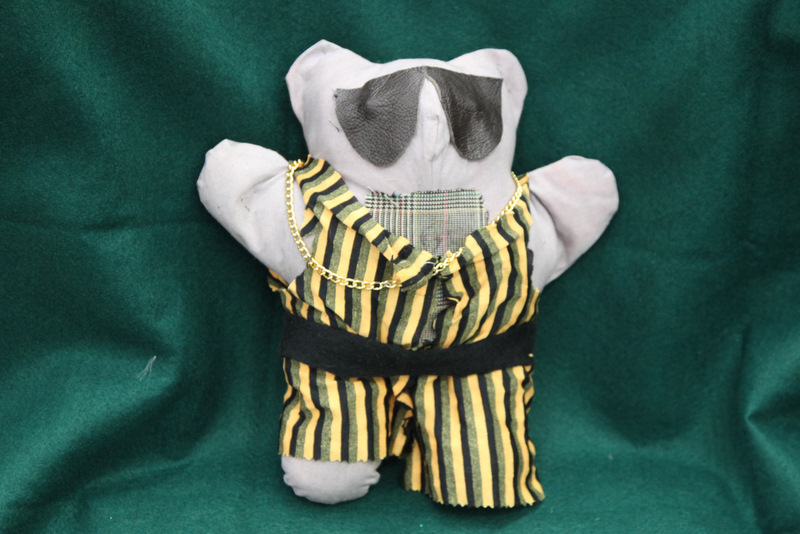 Monique also added buttons and beads to complete an original idea based on one of our Australian snakes. Congratulations Monique. Our School garden is looking its best after recent Spring rain. 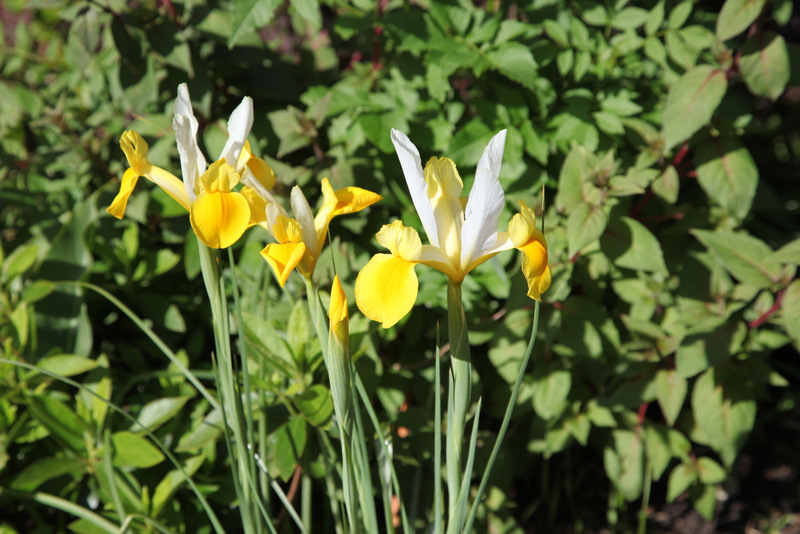 Amongst the many flowers in bloom are two sorts of Irises. I think it is important that students know the names of the common flowers and are given the chance to look closely in order to draw or paint them. Visitors often comment upon the excellent and calm behaviour of our students. 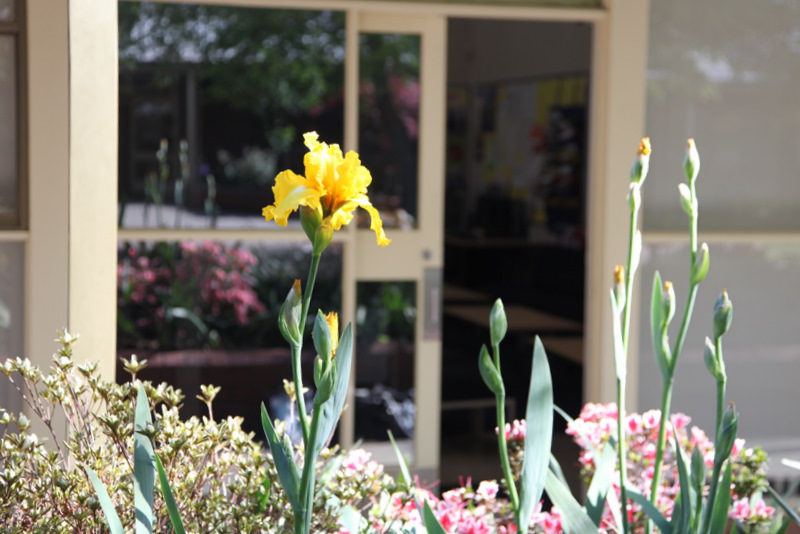 Beautiful surroundings, such as our school has, provide a wonderful and caring background for their learning at Taylors Lakes Primary School. 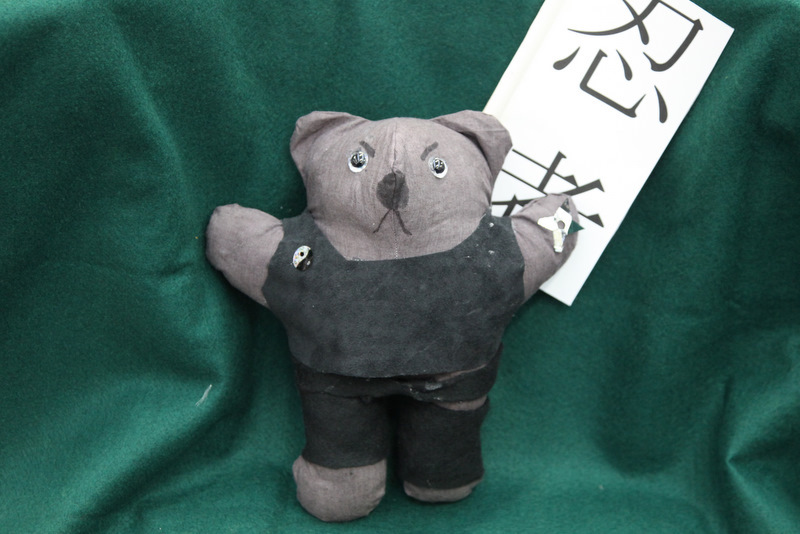 Staff members also feel good about their work environment and this is passed on to the students. We would like to say a special “thank you” to our talented gardener, Mr Laurence Jackson. 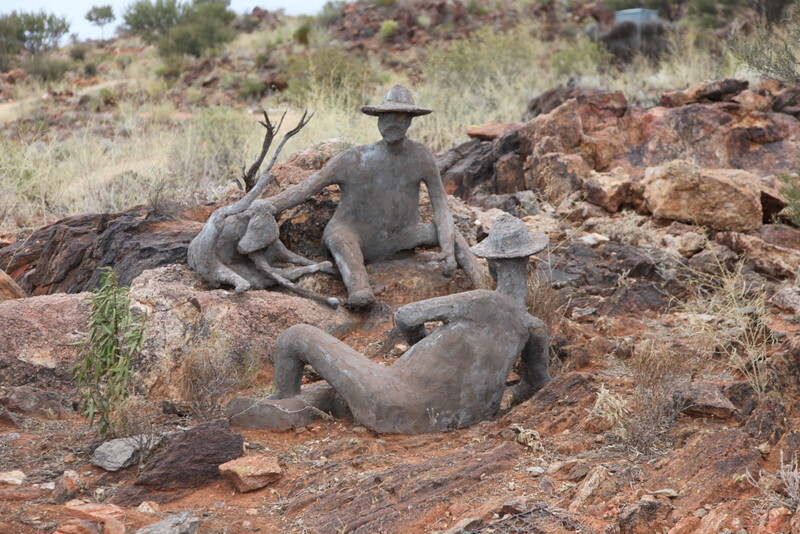 Two old miners and their dog rest beside their claim in the Living Desert Flora and Fauna Sanctuary north of Broken Hill. 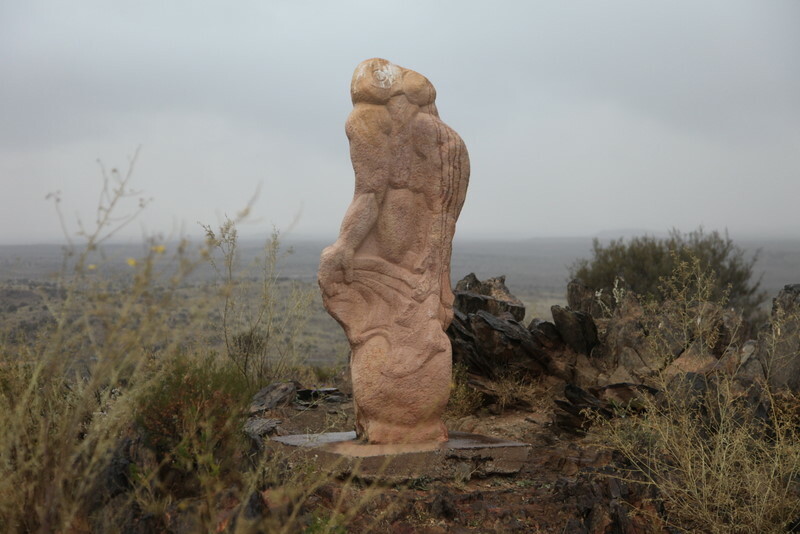 One of the many sculptures on a hilltop North of Broken Hill. 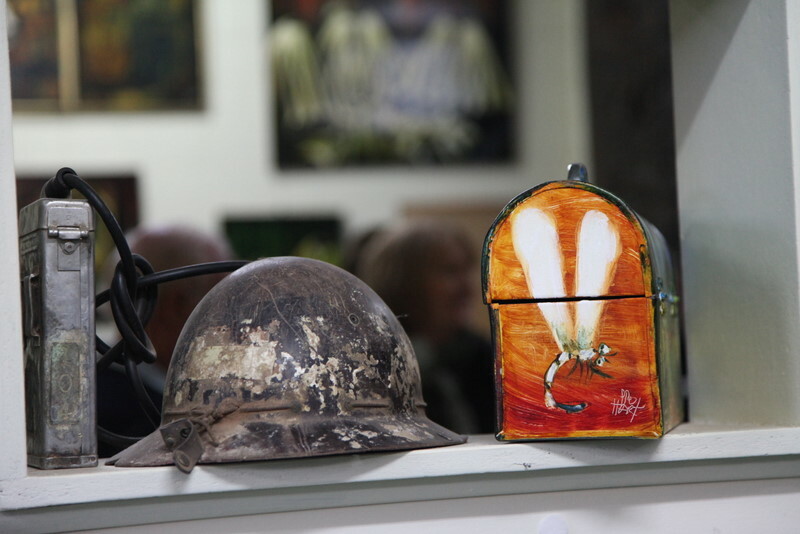 Pro Hart’s lunch box was among the many objects he painted. The most famous one was his Rolls Royce Shadow car. Pro Hart loved his Rolls Royces. 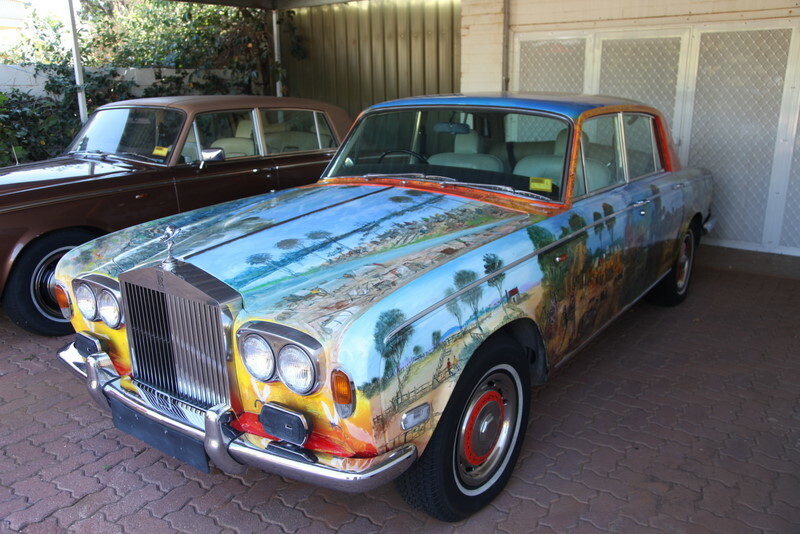 This one stands proudly in front of the Pro Hart Gallery in Broken Hill. 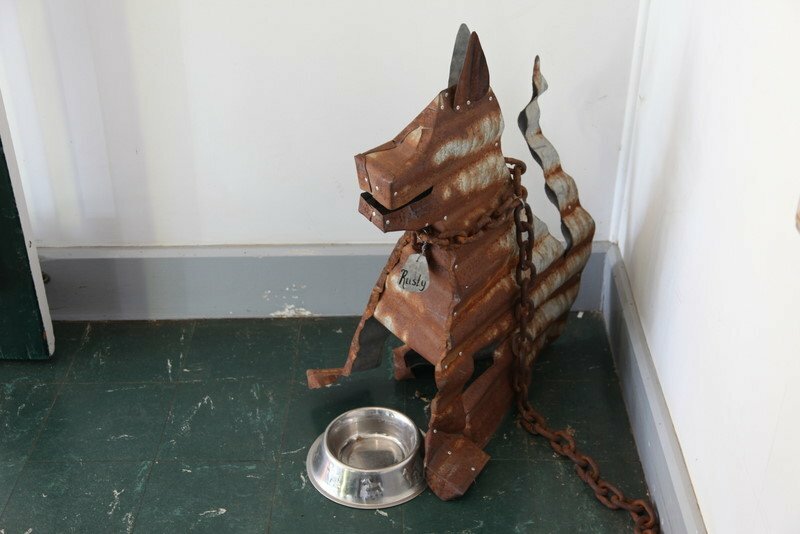 “Rusty” the corrugated iron dog guards the entrance to the Silver City Mint and Gallery. 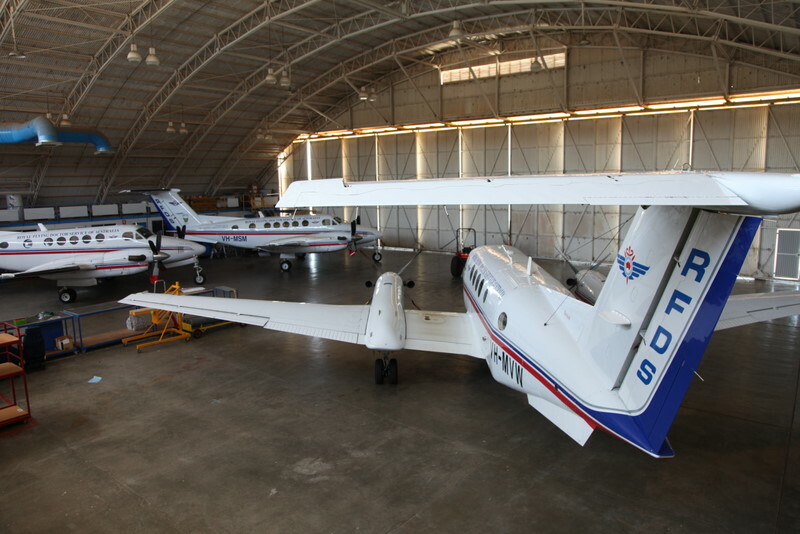 The Royal Flying Doctor Service is an essential part of health care in the outback of Australia. The Big Picture is an enormous single piece of canvas painted by “Ando”. 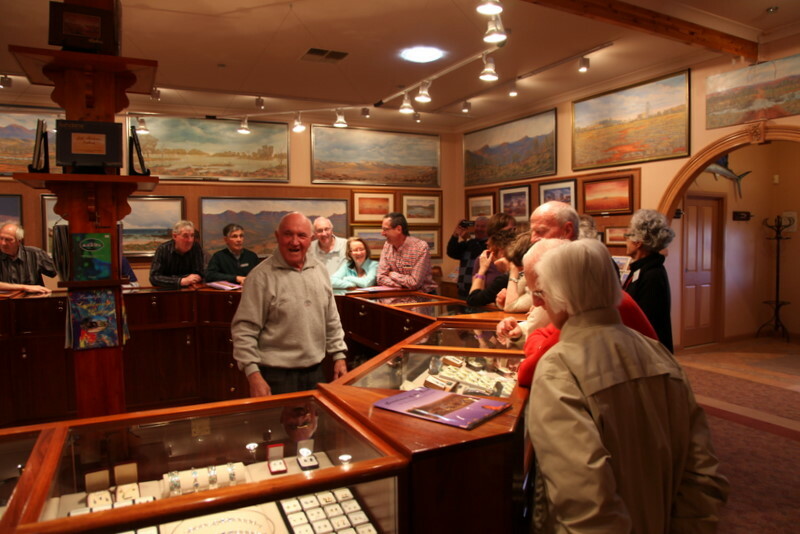 Broken Hill artist, Jack Absolom (centre) showed us his Opal collection and explained the various colours available at his Gallery. Our School Holidays are almost over and Term 4 will begin on Monday, 10th October. During my holiday we travelled 817 Kms to Broken Hill, New South Wales so I was determined to learn as much about the area as I could. Fortunately our Car Club tour organizer had prepared a variety of outings to Museums, Galleries and points of interest to showcase the mining city and its surrounds. A highlight of the visit was meeting Pro Hart’s wife Raylee and his son John (pictured above). 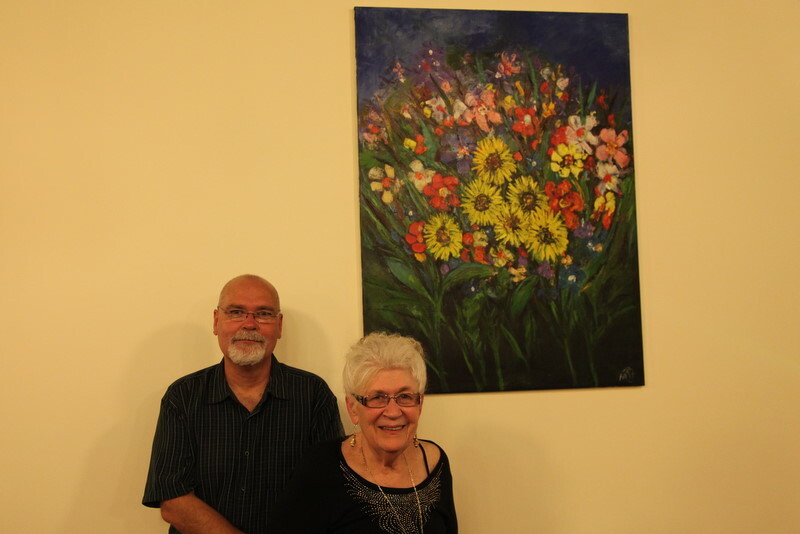 They are standing in front of an original Pro Hart painting. 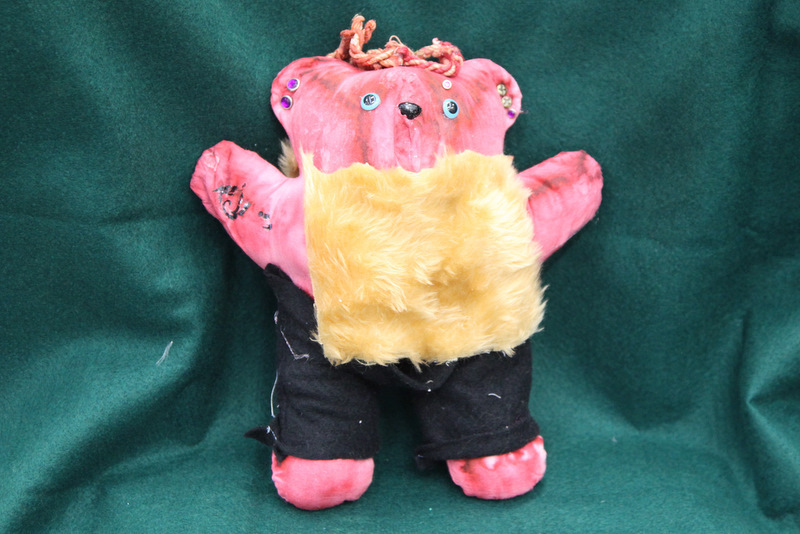 Pro and Raylee also had a daughter, Julie Hart, who is an artist and has a style very like her father’s. 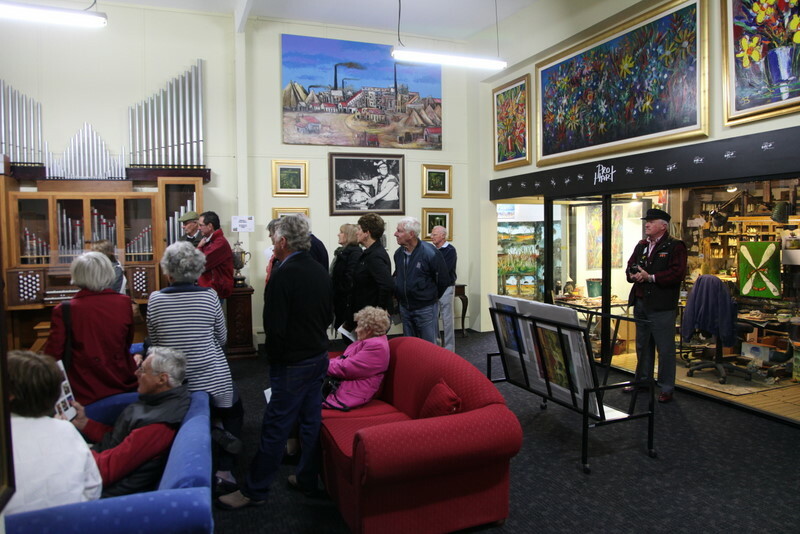 She has a Gallery in William Street, Broken Hill. 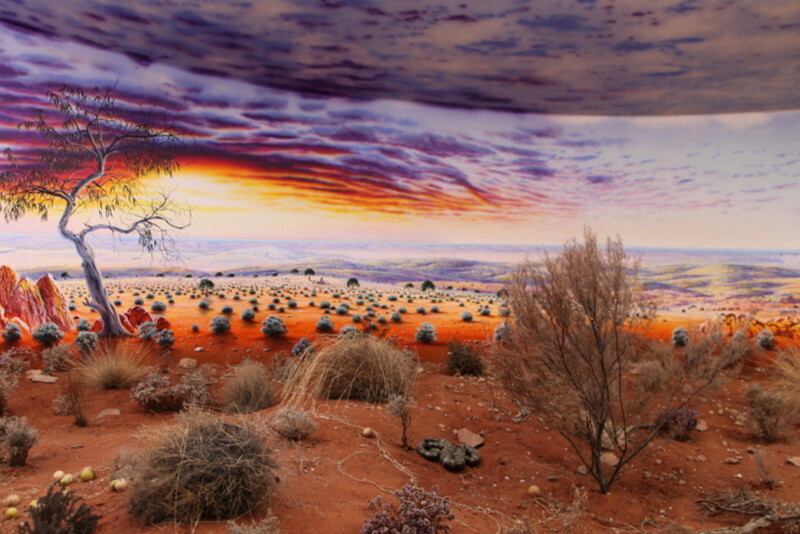 Broken Hill isn’t broken at all. Stone cottage at Silverton, a “ghost town” near Broken Hill, in New South Wales. 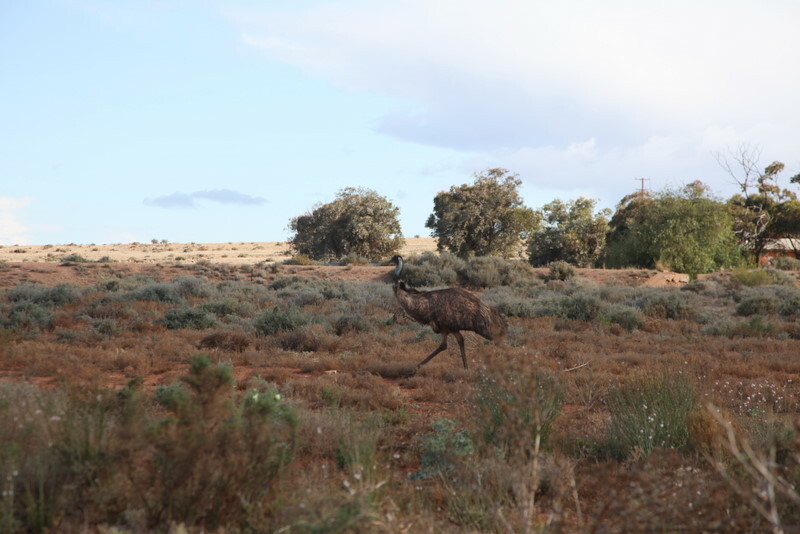 This Old Man Emu wasn’t keen to have his photograph taken at Silverton, New South Wales. 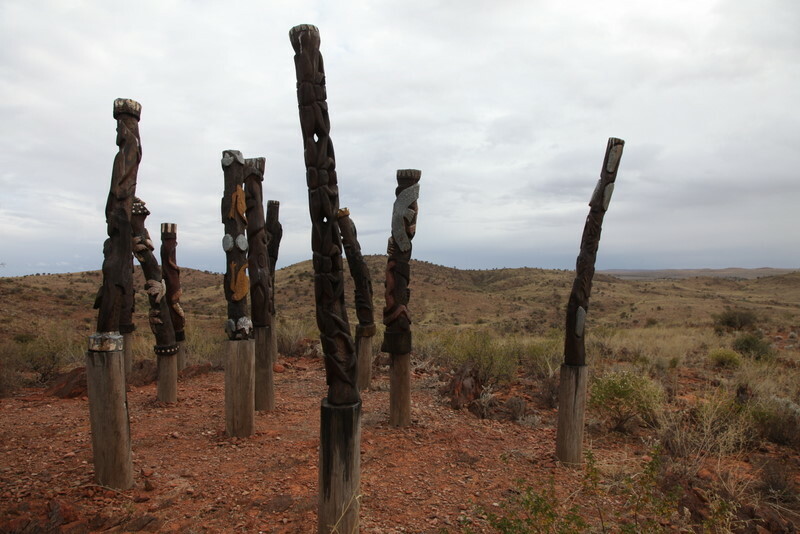 Carved Ceremonial poles at the Living Desert Flora and Fauna Sanctuary which is 9 miles North of Broken Hill. 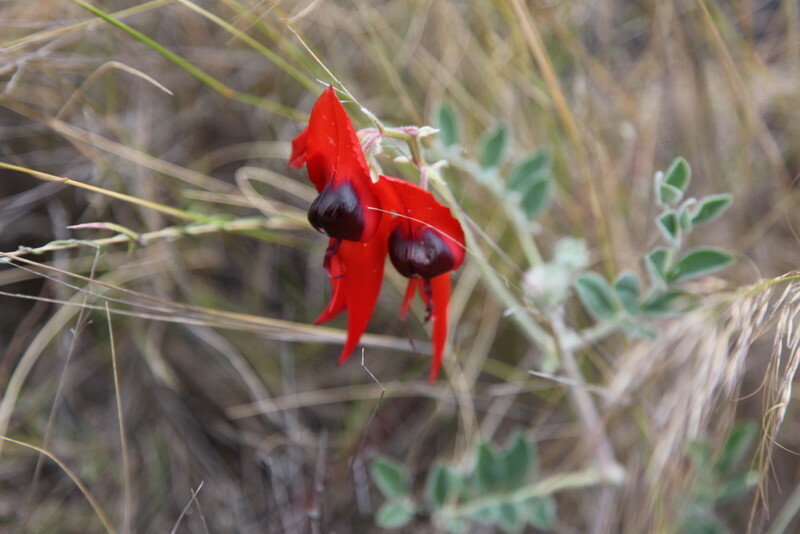 Sturt’s Desert Peas abound despite the desert conditions. Silverton has several Art Galleries. This ship was constructed by welding together junk metal items. Can you find the spanner? Pro Hart’s Gallery is a collection of his famous artworks showcasing his unique style. Sadly, Pro died in 2006. 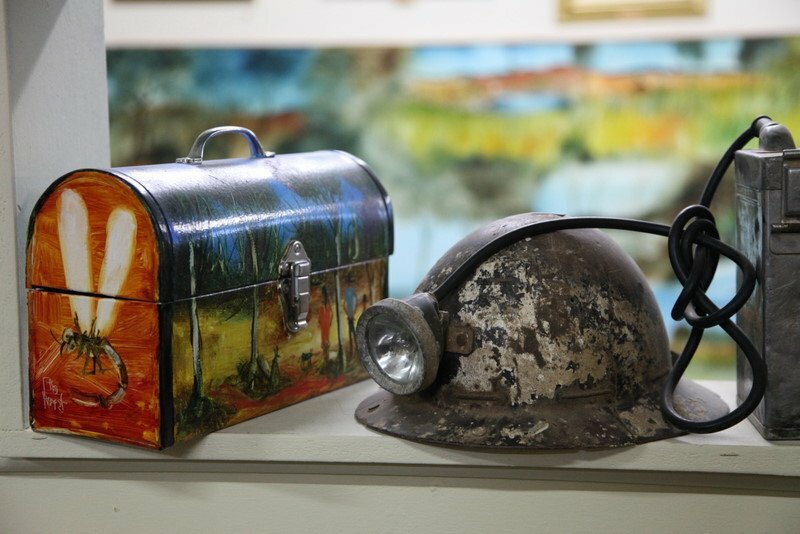 Australian artist Pro Hart painted his lunch box which he used when he worked in the mines at Broken Hill. He specialized in painting bush, mining and busy town scenes, dragonfies, his Rolls Royce car and, his signature, ants. Last weekend I spent several days on a Car Club trip to Broken Hill which is a mining city in far west New South Wales. Although line of lode of silver, lead and zinc is expected to be depleted over the next twenty years the people of Broken Hill are staying positive and are keen to have tourists visit their city. 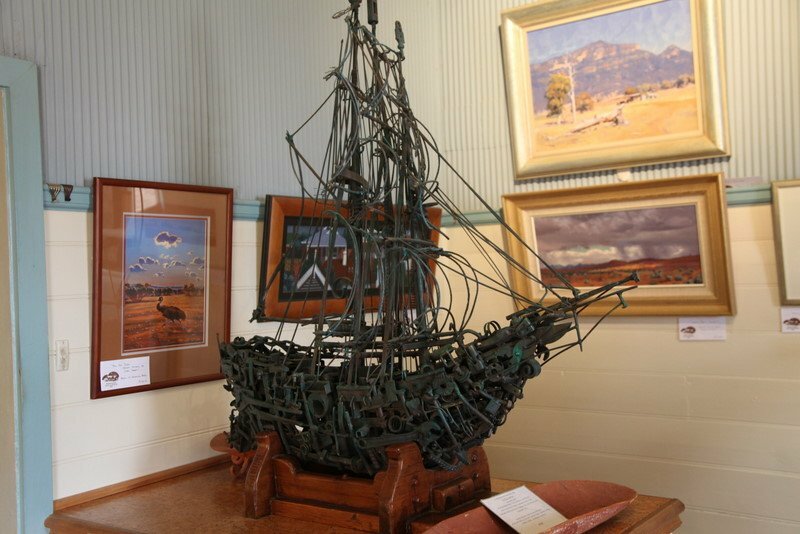 Visitors are given many opportunities to discover the wealth of mining history and the delightful artworks of such artists as Pro Hart. 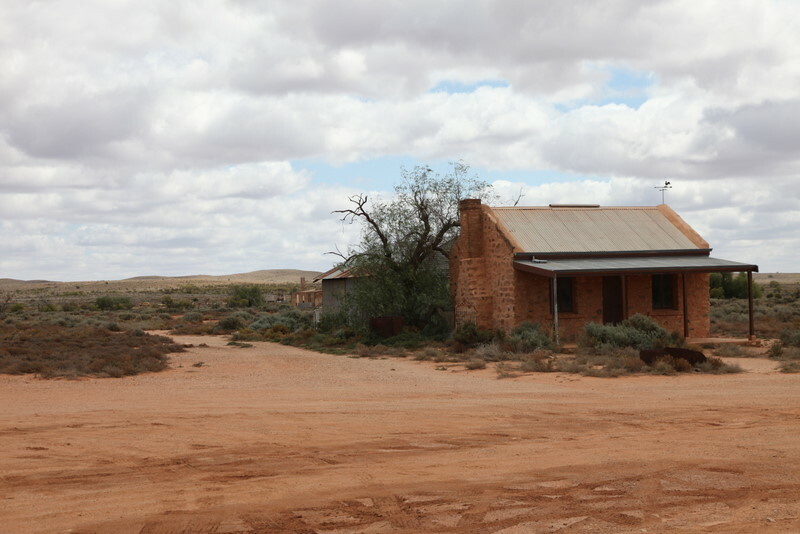 We visited local “ghost town”, Silverton, which is one of the nearby attractions and the Mundi Mundi Lookout. The interesting red and black flower is the Sturt Desert Pea which grows well in the dry conditions of the area.The carved poles are by local Aboriginal youth and sit on top of a hill in the Living Desert Flora and Fauna Sanctuary. 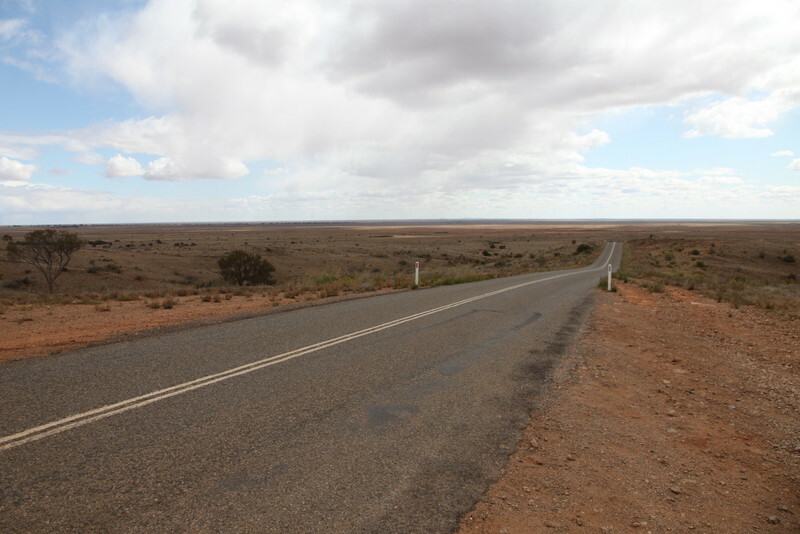 The road in the photograph above heads North into the distance from the Mundi Mundi lookout.